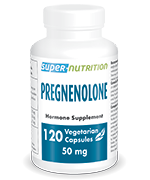 Pregnenolone is a natural hormone that plays a number of roles within the body. Mainly present in the brain, it primarily affects cognitive function such as memory and concentration. It also contributes to general well-being by influencing mood and the control of stress. 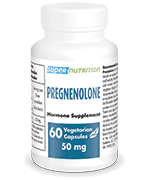 But pregnenolone is predominantly known as the precursor of DHEA and other hormones such as progesterone, cortisol and aldosterone. In enabling the synthesis of these molecules, pregnenolone supplementation thus combines the benefits of several hormone supplements. Benefit from the natural effects of this powerful hormone precursor with our range of pregnenolone-based dietary supplements.